Exciting offerings on show will be the d:facto™ Vocal and Linear Vocal microphones (watch comparison video here), d:dicate™ Recording mics, d:vote™ 4099 Instrument mics, and d:screet™ Miniature and d:fine™ Headset mics. 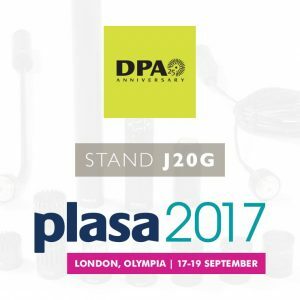 Over the last two-and-a-half decades, DPA’s goal has been to always provide its customers with the absolute finest possible microphone solutions for all its markets, which include live sound, recording, installation, theatre and broadcast. DPA takes no shortcuts when it comes to the design process, nor does the company compromise on its manufacturing process, which is done at the DPA factory in Denmark. DPA’s products are globally praised for exceptional clarity and transparency, unparalleled specifications and reliability. DPA has expanded on its already-formidable range of microphones by earlier this year releasing the d:vice™ Audio Interface, a high-quality AD converter for iPhone, iPad and PC/Mac. This is the first of its kind that allows Mono, Stereo and Dual Mono recording direct into your iOS device, compatible with apps such as GarageBand, Filmic Pro and Hindenberg voice recorder, to mention but a few, and turning your phone into a powerful dual channel sound recording device.